Changemaking is in the DNA of AFSers. Our volunteers facilitate intercultural experiences that are as life-changing to themselves as they are to AFS program participants. AFS volunteers dare to create change, and that can be translated into innovations in our internal processes and operations, as well as into positive impact on local communities addressing the pressing challenges of our times. So why not recognize those who are actively expanding the #AFSeffect into local action? As of 2015, outstanding initiatives led by AFS volunteers are rewarded in two different categories — Social Impact and Organizational Innovation. 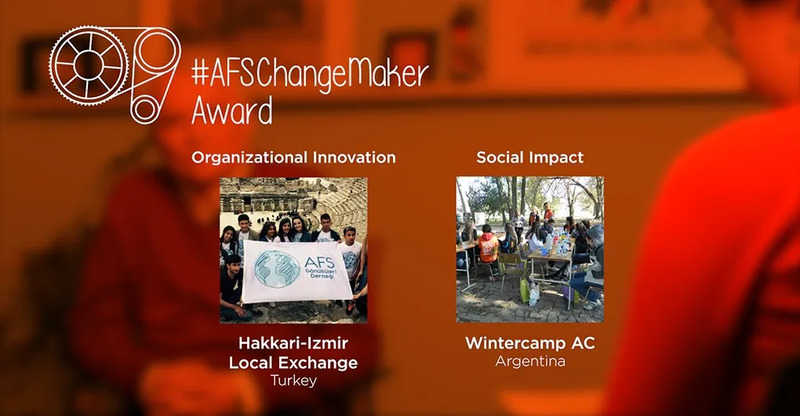 Any individual or group of volunteers — even AFS volunteer groups comprised of AFSers from different countries — that has developed or is developing a project that generates social impact in their communities or organizational innovation at AFS can submit nominations to the #AFSChangeMakers Award. The AFS Network Awards Committee nominates the finalists in each category and then the the best projects are voted by the other AFS volunteers. We are proud to present the winners of the 2015 Social Impact and Organizational Innovation awards for volunteers. The Social Impact Award identifies projects that reach beyond internal AFS audiences and have a positive effect on the social fabric of communities, on the environment and the well-being of individuals and families. We look for initiatives that tackle environmental degradation and climate change and/or societal issues such as youth unemployment, inter-generational dialogue, intercultural conflict, empowerment of marginalized groups, educational projects, or involve a wider definition of peace. For consideration, all projects must demonstrate how they serve our mission to provide intercultural learning opportunities to help people develop the competencies needed for a more just and peaceful world. In the social impact category, among many other amazing submissions, the panel and the AFS network found the Wintercamp AC from Argentina to excel. The goal of this project was to provide young participants (16–18 years old) with a practical and experience-based process, to identify their abilities, passions and knowledge, and to pinpoint a challenge in their community which they would address with an idea for a positive impact. The main topics of the resulting initiatives include preventing bullying, promoting integration among the students of primary and secondary school, environmental protection, raising awareness about leaving dogs on the streets, improving interest in studying, and fighting discrimination. This project offered young people an opportunity to develop a social business venture, in which they were allowed to think globally and act locally. With this, AFS demonstrated that we are more than a provider of intercultural exchanges — we are an organization which inspires observation, reflection, learning and creating change in the local culture, making an impact on the members of the community and their particular realities. The added value of this project comes from the involvement of a great number of high schools, students, teachers and authorities from different social, economic and cultural contexts. The Organizational Innovation Award recognizes intrapreneurship, or efforts that generate positive change in AFS organizations (at the local, regional, national or international level). Projects that change and improve our internal process and operations are awarded in this category. The best Organizational Innovation project for 2015 was awarded to Hakkari-Izmir Local Exchange from Turkey. The aim of the project was to host high school students from Hakkari — the most Eastern city of Turkey — in Izmir — one of Western most cities. As for the Hakkari and Izmir communities, there is a substantial prejudice towards each other due to national, religious and cultural backgrounds. The people who participated in this project have impacted their communities in forming an understanding, acknowledging the differences and increasing the communication; finally feeling like parts of Turkey’s cultural puzzle. Hakkari high school students and Izmir host families and volunteers got to know each other better, and developed a cross-cultural understanding, affecting their families, neighbors and societies too. Eleven students from Hakkari, aged between 14 and 16, participated in a week-long exchange in Izmir, stayed with local host families and attended events such as an archeological excavation, local art workshops and the rehearsal and concert of the Izmir Symphonic Orchestra. This project impacted all individuals who participated in it — a total of approximately 200 people. Today, many of them are in communication with each other, discussing what goes on in their home towns, and leading a positive the change in their communities. More people in Hakkari now know about AFS and its mission, and a major high school in the city is now encouraging students to apply to participate in AFS programs. Originally published in Connect: Intercultural Insights for Global Citizens — curated by AFS Intercultural Programs.